On 23rd March 2017, the President of Mozambique formally opened Torres Rani in Maputo. President Filipe Jacinto Nyusi was accompanied by Minister Silva Dunduro, Governor Yolanda Cintura and Mayor David Simango together with Abdulla Aujan and members of the Aujan and Minor Group management teams. 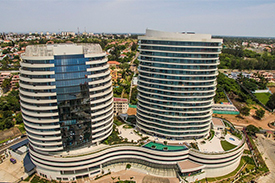 The event was hosted by owners, the Aujan Group and the Minor Group who have invested more than $200m in the Torres Rani complex which includes the Radisson Blu Hotel as well as the new office and residential towers. The President called the Aujan and Minor Groups “courageous with a great vision” and in a poignant speech, Abdulla Aujan honored his father, Sheikh Adel Aujan, who passed away earlier this year. He explained that the Torres Rani project was a fitting tribute to his father´s creativity and passion for a vibrant and optimistic country. Abdulla also thanked the Government of Mozambique for their incredible support and extended his gratitude to the various companies and individuals that had contributed to the project. Please click here to read the full text of Abdulla Aujan’s speech.